Please use the search bar located in the top-right corner of the website to find products using a name or word. Typing 'designer' into the search bar will return all products that contain the word 'designer' within their name or description. However, we have avoided using such speciifc terms in product descriptions and names, preferring instead to categorise products into broad categories for ease of use. This would return few results and you should use the lefthand menu. 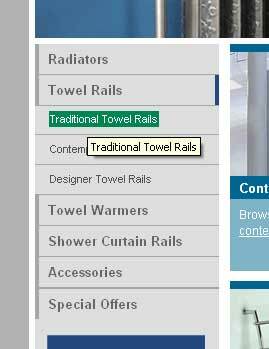 If you have a more specific requirement you should use the lefthand menu which separates products into easily understood main categories., For example if you wish to view a list of all radiators in our Designer section, you should use the lefthand menu to select the Designer Radiators section. A search for 'stylish' would yield many pages of results – 6 at time of writing – and would offer a variety of products. 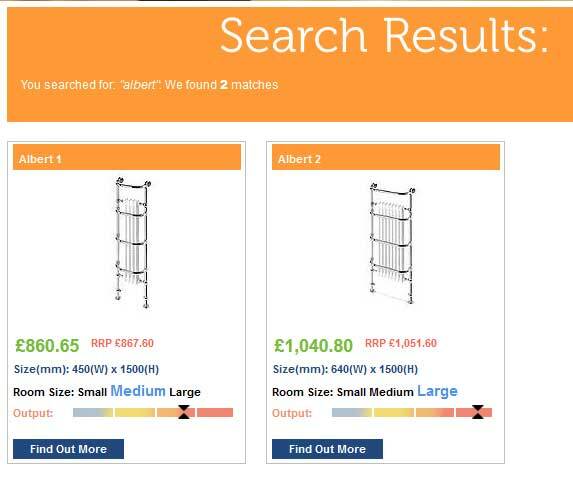 These search results can then be filtered by category type – so you could choose to view only radiators or rails – and sorted by price low or high or by name. In our example image you can see we already know the name of a product that we're interested in – maybe we've found it in search engine listings or seen the item on display in a showroom. Category listings and search results show the main product image, base price - the price for the most basic configuration of that item - and a short excerpt of the product description. Clicking on the product image or the Find Out More link will take you straight to the product details page. Our home heating products can accomodate hard water by using alternative materials; please contact our sales team for more information. These are conventional hot water models, designed to fit into a standard central heating system. All models can be supplied Glycol filled with an electrical element fitted. These conventional hot water models are fitted with an electric element so they can still be used when the central heating system is not on. 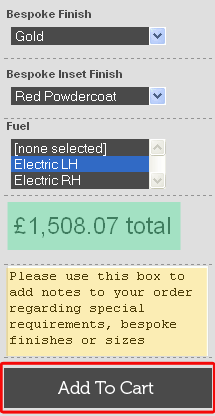 You can see an example of fuel options available with our Albert product that we selected earlier. This product will can supplied to work with a water or electric fuel system. Not all products have multiple fuel options. 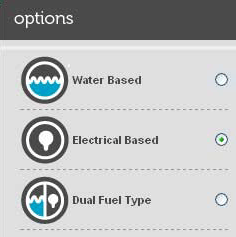 Select your required fuel option frpm the menu on the right of the page. Note the price on the page changes to reflect changes in product options. The price shown on the page after you have made your selections is the price that will be entered into your shopping basket for that product and is the price you will pay for that product when you place your order. The radiators that we design and manufacture ourselves can be ordered in a range of colours and finishes. Radiators in the Designer section can only be supplied in a limited range of finishes and colours as designated by the original manufacturer. 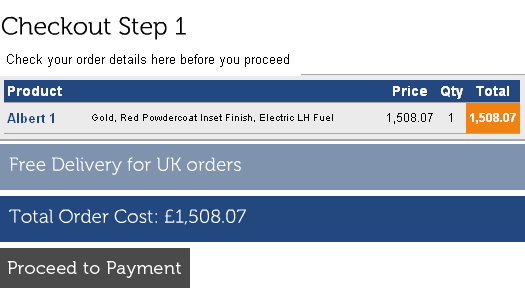 As you choose different finish options in the product details page, you will see the price below the fuel box changing. This price reflects the cost of the materials you have selected. Choosing Gold finishes will cost more than Nickel finishes, for example. The price that you see in this box is the price that you will pay for this time with the configuration that you have selected at the time you press the Add to Cart button. Maybe you only have limited space for your heating product or you really like the design of one of our radiators but you can't see the colour you want on our product page. The majority of people will find that their home heating needs will be met by the standard radiators, towel rails and home heating accessories in our range. However, customers can request a bespoke configuration for most of the products we supply. Please use the notes box in the products information page when ordering to tell us about special finishes or unique dimensions that you require. We will be able to fulfill most requirements though some bespoke manufacturing or finishing will incur an extra cost which we will of course discuss with you before building your item. Our staff are happy to talk to you about any aspect of your home heating needs. Most of the time we'll ask you for a simple illustration and we'll talk to you about your requirements before we start building your bespoke item. See our Albert 1 example below. 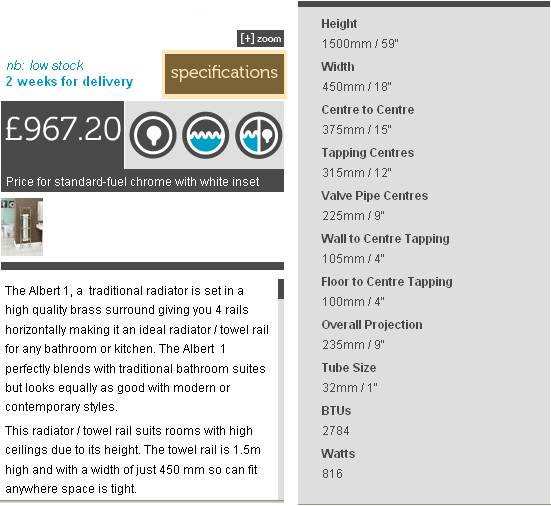 Clicking on the Specifications tab displays the product specifications on the right of the page. You can return to viewing and changing the product options at any time by clicking the Options link above this box. Use these specifications, along with the product description, as a guide to ensuring that you are buying the right heating product for your home. You can see here that we've added a product to our cart - the Albert 1. The Shopping Cart at the top of the Warmer Ideas website shows the items that you've added to your cart and their quantity and cost. Payment for goods purchased in the Warmer Ideas online catalogue is secured by the Protx payment gateway which esnures that your credit card details are kept private and safe. If you would like to purchase products from us but wish to use a payment method that isn't supported by the Protx system, please call or email us with details of your requirements and we will make alternative arrangements for you. The checkout page gives a more detailed breakdown of your shopping cart. Click the 'Proceed to Payment' button to move to the next step and begin your purchase. 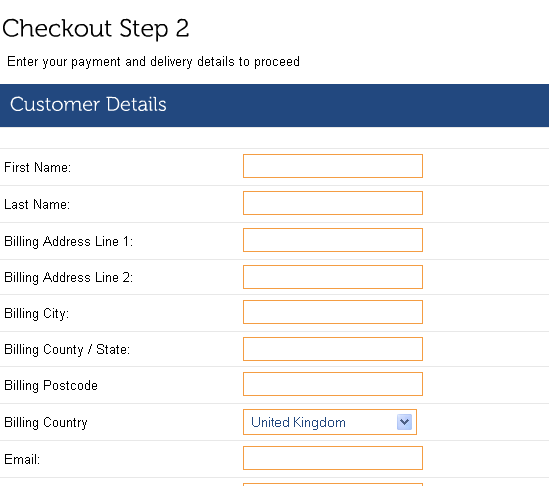 If requesting delivery to a country outside of the UK mainland, select your country in the 'Billing Country' dropdown list to get an instant calculation of shipping costs before you proceed with your order. Fill in your details to proceed to the secure SagePay Protx payment system. Using this system ensures that your credit card details are never stored on our system or sent by email to our staff or to you. Only your address details are passed between Warmer Ideas and our customers. Our products are delivered free of charge to the mainland United Kingdom. Delivery charges will apply to other areas. These charges will be calculated and applied during the checkout process and displayed clearly to you. Please call if you can't find your delivery location listed amongst the areas in our checkout page.